This week we have the spotlight on the incredible Allure On Vista. This waterfront property is absolutely perfect for outdoor entertaining. Allure On Vista has 5 large bedrooms that will sleep you and 11 of your friends as well as your very own home theatre to keep you entertained into the night. 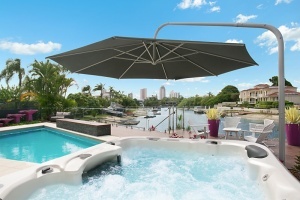 This incredible home is just a short walk from all the attractions of Broadbeach, including Jupiter’s Casino, Pacific Fair Shopping Centre and the restaurant precinct. Plus, it’s only a 20 minute walk to the G:link Tram which can take you to Surfers Paradise in just minutes. Allure On Vista is the champion of outdoor entertaining, with everything that you could wish for right in your backyard. The most enticing feature is that Allure is right on the water and includes your very own pontoon that is perfect for the kids to jump off over-enthusiastically. 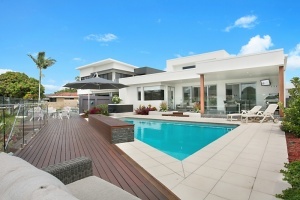 You also have the choice between the pool and a heated spa, both being overlooked by a modern outdoor dining area. 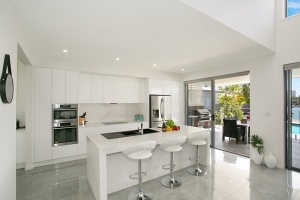 This state of the art kitchen is perfect for people of any skill level whether you’re wanting to cook a gourmet meal or searching for the simplest meal solution. If you’re after a night off cooking, then we can help you out by bring in one of our very own chef’s to provide you with a delicious and hassle free feast. If this spectacular home is too much to resist, call the team on 07 5592 3881 and begin the countdown to a relaxing holiday in the sun.